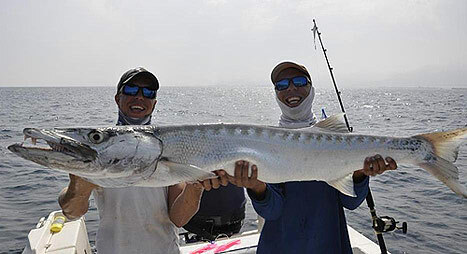 Black Marlin are caught by trolling big Pulsator Marlin lures and Billfish teasers. They are usually found around the tankers where the bait fish are hiding including Mackerel, Bonito, Tuna and Rainbow Runners and we have also encountered marlin up to 35 nautical miles offshore. 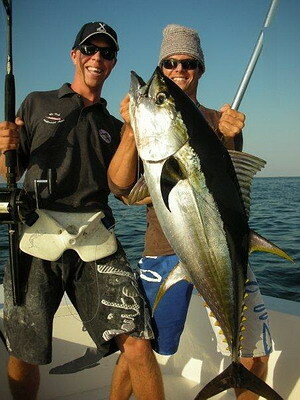 We also use live bait for the Marlin rigging a Tuna or Bonito on a bridle and slow troll this at the chosen area. We have found that the warmer summer months produce more action than the cooler winter months. Stripeys are the most beautiful of all the billfish species. They don’t grow as big as Black and Blue Marlin but they still give a very good acrobatic fight for the angler lucky enough to hook one. 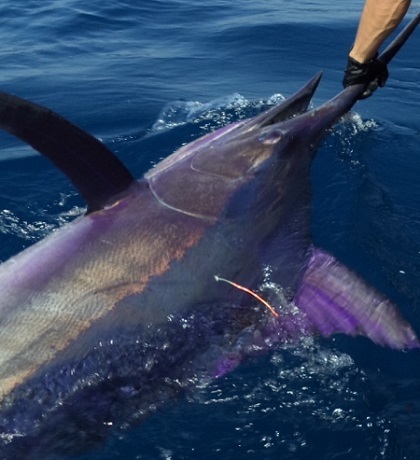 Our Striped Marlin off Fujairah have all been caught while trolling Pulsator Lures such as the Marlin Magnet and the smaller Mono Exciters rigged with strip baits or Ballyhoo. 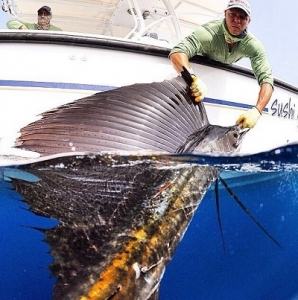 The Sailfish is encountered all year round and is both a shallow and deep water species. We troll smaller soft-headed Pulsator lures rigged with strip baits and soft teaser birds. Live baiting with small Goggle eyes is also a very successful method. 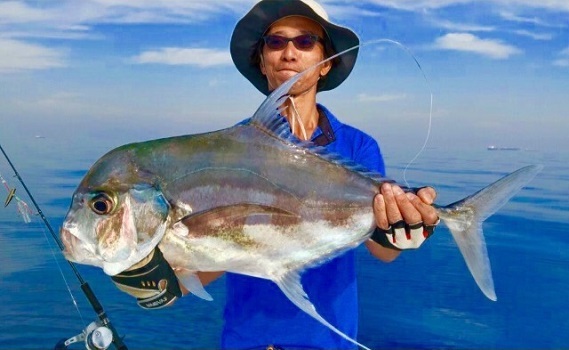 The Yellow Fin Tuna is a seasonal fish and only caught in a select few months of the year and is caught both during the day as well as at night around the tankers where the bait fish are hiding. We have also found jigging, spooning and live baiting to be the most successful methods. We catch this hard fighting and excellent eating Tuna all year round but the smaller fish are more prolific during the warm summer months when we find them on the surface smashing balls of baitfish. 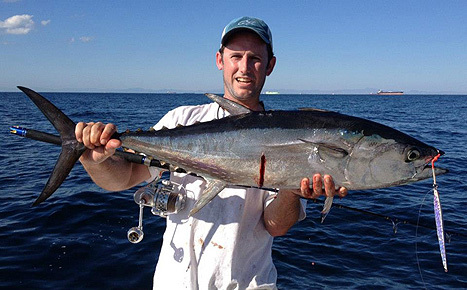 Casting small metallic spoons and trolling small squids are effective methods to catch this Tuna. We catch the bigger fish during the cooler winter months and they are mainly found on or near the bottom in depths of 100 meters and more. 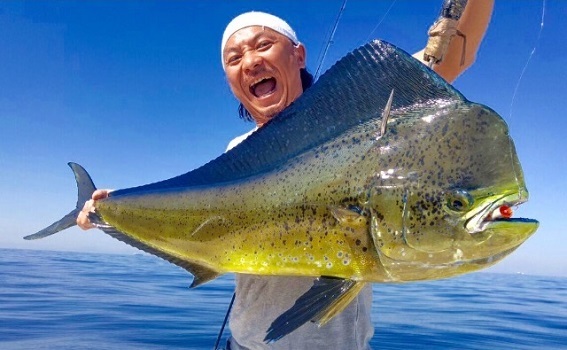 The Dorado or Mahi Mahi is found all year round and are caught at the tankers on either live baits, small trolled lures or feathers, deep jigging, popping and casting. 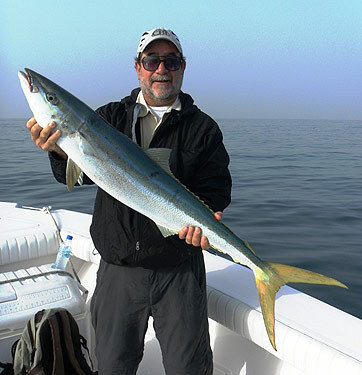 The Dorado or Mahi Mahi is the most common and prolific species that we catch off Fujairah and is found all your round. Many smaller fish up to 12 pounds in the summer months and less but larger fish up to 30 pounds during the cooler winter months. They are caught around the many tankers, channel markers or floating debris on either live baits. 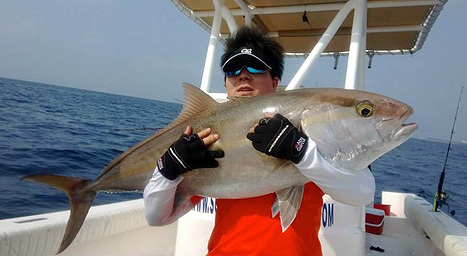 Amberjack are a deep water species that possess brute strength and will only be landed by using the best tackle available. They are caught by jigging in extreme depths over wrecks and pinnacles. Wahoo are among the fastest pelagic species (reaching speeds up to 96 k/hour) and are capable of capturing a wide range of prey. 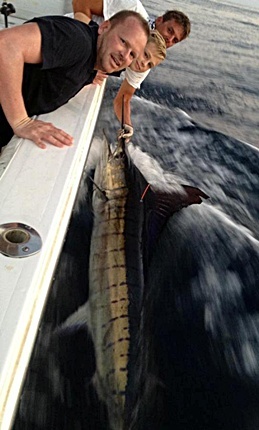 We catch our Wahoo on trolled lures and live baits and are often found along with Dorado hunting under floating debris like old crates and steel drums. These big Red Snappers are caught off deep ledges and jagged reefs in depths of 350 to 600 feet of water. We have caught the majority of these Snappers on vertical jigs while deep jigging for Amberjack off Fujairah. These toothy predators are caught on our trolled surface Pulsator lures, live baits and they also attack our jigs while deep jigging and are found in abundance during the cooler winter months in the cold green water. These hard fighting fish are caught on soft plastics, lures and live baits. They tend to be found around the chain of tankers that have been anchored for long periods of time. 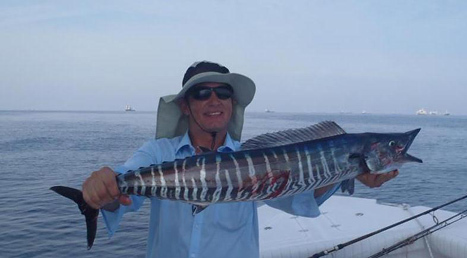 Rainbow Runners are extremely good eating and are always a welcome fish to have on board. These hard fighting Trevally are caught in various depths in both the summer and winter and are found over the wrecks and deep ledges. We have had great success catching these pretty looking fish using a slow pitch jigging technique.